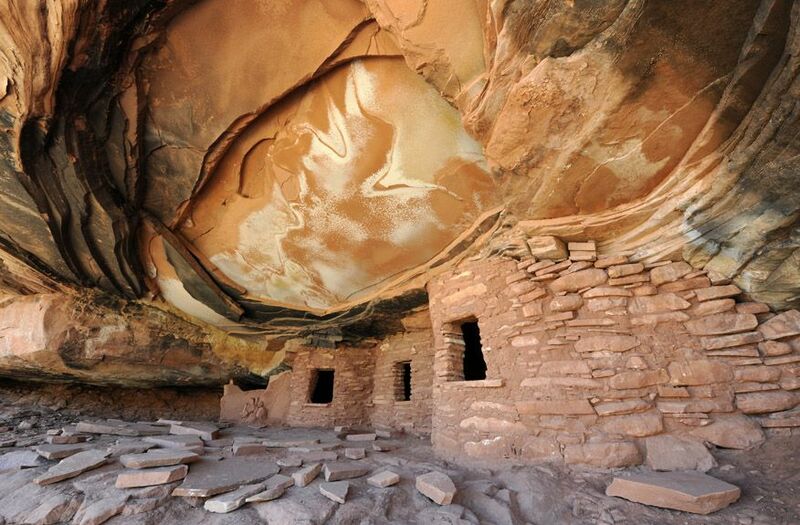 Cedar Mesa is the archaeological crown jewel of the millions of acres of public lands administered by the Bureau of Land Management. It has exceptionally well-preserved ruins and world-class rock art – all in a phenomenally scenic, hiker-friendly landscape. Download free maps, directions and GPS coordinates for photo locations such as House on Fire, Fallen Roof Ruin and Perfect Kiva. A high clearance vehicle is advised for accessing this trailhead, four-wheel-drive is not required. This area is criss-crossed with roads. Stay on the road described until told to turn off of it. The trailhead contains parking for several vehicles. Camping is available at the trailhead and other nearby locations. A carefully driven passenger car can usually access this trailhead in good weather. From Blanding, Utah travel south on Utah Highway 191 for 3 miles to the junction of Utah Highway 191 and Utah Highway 95. Travel west 28 miles on Utah Highway 95 to the junction of Utah Highway 95 and Utah Highway 261. Travel south on Utah Highway 261 for approximately 13 miles to mile mark 19.1 and the signed Cigarette Springs Road (N37 23.786 W109 56.632). 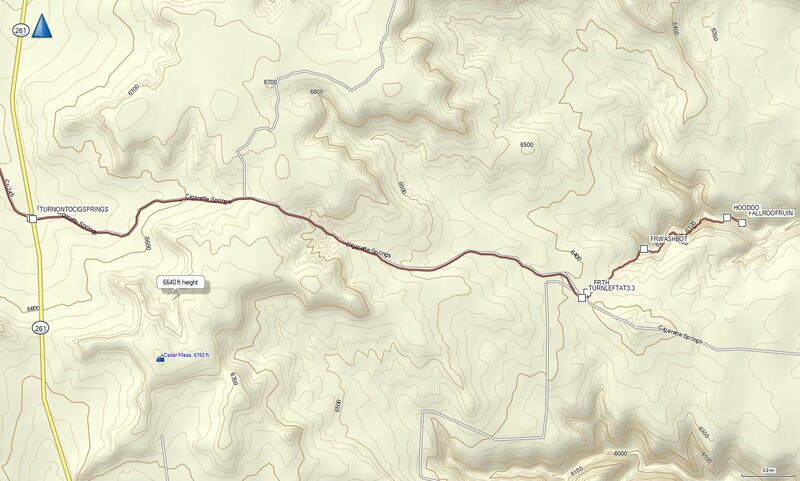 Reset your mileage here and turn east (left) onto the Cigarette Springs Road (SJC 239). Follow the well maintained dirt road for 3.3 miles. At this point you should see a track leading 50-yards north (left) to a large parking area in the pinion trees. This is Fallen Roof Trailhead. There is parking for several vehicles at the trailhead. From the Fallen Roof Trailhead (N37 23.436 W109 53.298) hike northeast along the well defined trail. Shortly the trail will switchback to the bottom of a minor tributary of Road Canyon. Upon reaching the bottom of the tributary continue downstream until you reach the confluence with Road Canyon (N37° 23' 47", W109° 52' 36"). Hike down Road Canyon for approximately 200-yards and you should see a large hoodoo (N37 23.801 W109 52.461) on your north (left) side. At this point you should also be able to see Fallen Roof Ruins straight ahead hidden under a ledge midway up the canyon wall on the left. The easiest way to reach the ruins is to climb up the slickrock to the base of the hoodoo, and follow the ledge the hoodoo in on until you reach the Fallen Roof Ruins (N37 23.774 W109 52.368). Best time to photograph: Before 10:30am (April) by late morning the ruin area will be in shade/sun. By walking east on the same ledge that Fallen Roof is located on we uncovered several more ruins within the next 1/2 mile. The other ruins are in poor condition or smaller. Watch carefully as you hike along the ledge and you will also notice several small granaries. 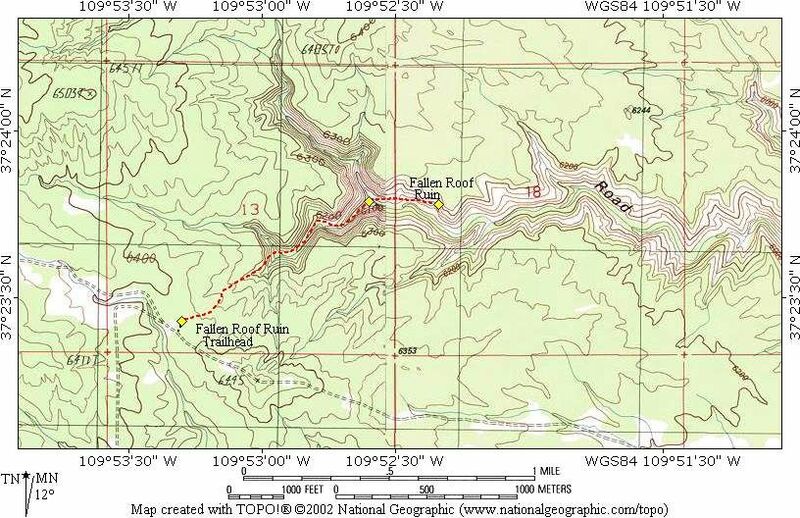 This location requires moderate route exploration and is marked on the downloadable map. Select the green “View Map” tab to view this location on Google maps. Download a free copy of the Four Factors of Filter Highlight Photography in PDF format by selecting the “ebook download” tab above. This 37 page guide covers how to take a single image and apply minor manipulations that will help you produce consistent reproducible results. You will also learn the processes of camera set-up, image editing, and advance scouting techniques used by professional photographer Christian James. Free park maps, tide tables reports, ebooks and additional information can be found under the Maps and Resource tab located in the black bar at the top of the screen. The best time to photograph this locations is early morning. Nikon D3x 14-24mm Lens @ 14mm f16 @ 1/2 second ISO 50 Exposure Value 0.0 with a 3 Stop (0.9) Soft-Step Spilt ND Filter. 4/9/12 9:42 a.m.